Lindy hop is the casual pair dancing started in Harlem in 1920’s. The lindy hop became popular along with the big band swing. Although, In Sendai, we enjoy lindy hop including east coast (6 count) swing, charleston and balboa steps with the music of early jazz, jive, rockabilly and rock’n’roll. We are the swing dance community in Sendai. You can also join Sendai Swing Club group! It is a swing group working in Tokyo. Even if you never done a dance! Many people have started with inexperience. As only friendly dancers, please come to lessons and events without anxiety. Let’s have fun together! It is a familiar swing dance event that is very friendly and keeps being loved by the community. Everyone please feel free to participate. Swing dance scene in Japan started with Frankie Manning and Tokyo Swing Dance Society in 1998. 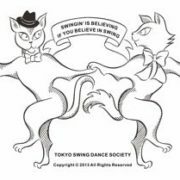 TSDS and Swing Cats Tokyo present full-swing lindyhop lessons and swing dance events. For more information, visit here. The Tokyo Swing Night(TSN), a dj’ed weekly swing dance night at a premium night club in Omotesando, Tokyo. TSN is the best place to enjoy social swing-dancing in Tokyo. All the swing dancers will be welcome. There is a free dance lesson for beginners. Schedule of TSN is as follows. ◇ Shoes : No highheels. Flat shoes or sneakers recommended. Swing jack is a club event of swing and Lindy hop to enjoy the music and fashion and dance. Please enjoy music with delicious sake. Chocolate shake is an event that is a variety of rich songs from swing to jive. You can dance as much as you like at the wide venue of the atmosphere of the wooden floor. Amore and Lulu met Lindy Hop in 2003, actively participated in numerous overseas dance camps and workshops, and also won the competition overseas. Started Lindy Hop class from 2008. Every year, we hold a three-day swing event “Mood For Swing” in May and invite the world’s top seasonal dancers to do workshops, parties, competitions, etc. It is an event that you can enjoy swing, jive, rockabilly and oldies overnight.Live, DJ, vintage shops and more. We want to dance with Lindy hoppers all of the world using LEAD&FOLLOW. At the end of 2001, it changed her life. Mariko’s music lovers introduced her swing dance, and immediately she threw herself into the world. She loves the authentic style of swing in 1930s-50s. She has the motto that she follows not only the dance style of the era but music and even the way of her dressing. Mariko dedicates herself that people enjoy swing in Japan. She has been performing vigorously at a number of events to introduce it. She loves social dancing and you see her at competitions and events even in Korea and cities in the US, too. Her friendship network is growing and soon is going to reach the every corner of the earth. Nowadays, She has been connected with musicians who love the music same era as lindyhop and runs swing event together. Through Mariko, he started swing dance, and has been working in partnership with her since 2014. He’s still relatively new as a swing dancer, yet has won awards at foreign competitions. With his natural rhythm and dance sense, he stands out in the swing scene. His sunny smile and fun musicality has always been entertaining to the followers. We’re having our regular dance, Osaka Swingin’ Night EVERY THURSDAY night! Our pretty venue is Cafetin de Buenos Aires that has red interior decorating. Roger Schmidlin (Switzerland/Australia) is visiting Kobe for a short time. He loves aerials and anything to do with energy. He has helped building Swing Scenes in Switzerland, U.S.A., Australia and now here in Kobe. Natsuki is the connector behind the scene. She is local to Kobe and is doing anything to help the Swing scene to grow. 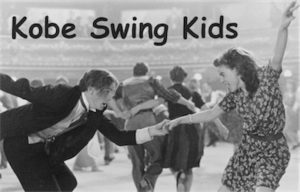 20:30 – Swing tunes to dance, all night long!!! We are the swing dance community in Fukuoka. We love swing dance. Do you want to try a new dance? Maybe you have seen amazing videos on Youtube or a friend told you about how much fun it is to swing. So, here’s your chance to get started right now! Copyright © 2019 日本スイングダンス協会 All Rights Reserved.